Ghandrung/ Ghandruk trekking provides a good introduction into trekking whilst also providing some wonderful close up views of both the sacred mountain Macchapuchre (Fishtail) and Annapurna South. Ghandrung trekking is one of the popular trekking trail in Annapurna region even people has short holiday duration for Nepal Himalaya trekking and fit for all age groups travellers to Nepal. Ghandrung village trekking offer panoramic Himalayan views including Dhaulagiri 8167m,Nilgiri 7041m, Fishtail/Machhapuchhare 6998m, Annapurna I 8091m, Annapurna II 7939m , Annapurna III7555m, Annapurna IV 7525m, Annapurna south 7219m, Hiunchuli 6441m, Lamjung Himal 6986m,, etc, see different type of Animals such as musk dears, leopards, jackals, mountain Thar, birds such as Pheasant, long tails birds, relaxing with mixed culture such as Bramin, Chhetri, Gurung, magars, Thakalies Our destination is the beautiful and ornate village of Ghandruk, home to the Annapurna Conservation Area Project. Here you have a chance to visit the project to discover at first hand the conservation work being carried out. A refreshing three days allowing an insight into mountain life. Maximum altitude 2600 meters. 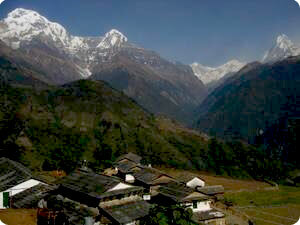 Highest access of the trek: handrung village 1920m. Day 01: Arrival in kathmandu 1334m, transfer to hotel , Ghandrung village trekking briefing with officially arrangements. overnight at kathmandu hotel. .
Day 04: Ghandrung village trek to Jhinudada 1547m (Natural Hot spring) where you will enjoy with hot spring. Day 07: Dhampus trek to Phedi than by private vehicle drive to pokhara. Day 09: After breakfast, our tour guide will take to for historical monuments sightseing in kathmandu valley such as Bhaktapur, Pasupatinath, Boudhhanath, Kathmandu durbar square and Monkey temple(swyambhunath) and in the evening farewell dinner in Restaurant, overnight at kathmandu in Hotel. .
Day 10: After breakfast, Relaxing/shopping with own activities than drop to Kathmandu international airport for onward journey. .